We cooked a ham a couple weeks ago, and after quite a few days of picking it apart for leftovers, we threw the ham bone into the freezer in anticipation of making ham and bean soup a week later. This is something my mom used to make -- and I loved it. My sister hated it, which meant more for me! 1. Heat a large stock pot up over medium heat. Place the ham bone in to start searing the meat and rendering the fat. Turn a couple times, heating for a total of about 15 minutes. 2. 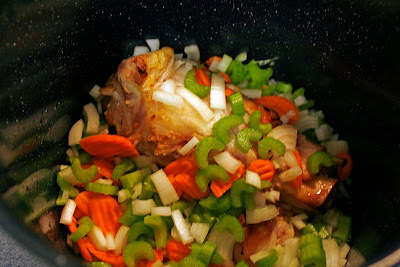 Add onion, celery, carrots & garlic. 3. After about 10 minutes, add white wine and stir up any bits stuck to the bottom. 4. Add the beans, then add water until everything is covered. 5. Stir in the spices to taste. Add some others if you'd like -- I'm sure I added some I forgot about. 6. Cook over low heat until the beans are soft, about an hour or so. 7. 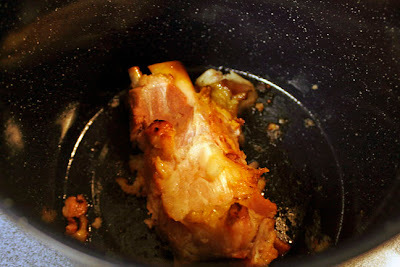 Shortly before serving, remove the ham bone, trim off as much meat as possible to return back to the soup pot. I served this with another one of favorite recipes that my mom used to make -- moist and delicious cornbread, which I'll post about soon! This soup gets even better the next day, as the flavors all meld together. Enjoy. MMM, that looks good. 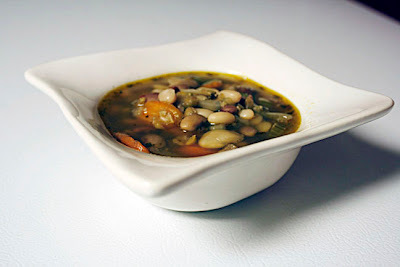 I still enjoy making bean soup, especially now that I don't have to listen to someone's complaints!!! Homemade soup and cornbread.......one of life's comfort foods! And the Cornbread (The recipe your grandmother has labeled as 'Corn Pie') is always wonderful! Nice for a cold evening's dinner! This is the most disgusting recipe right under any type of stuffing... I can't believe you even posted this is an edible suggestion.